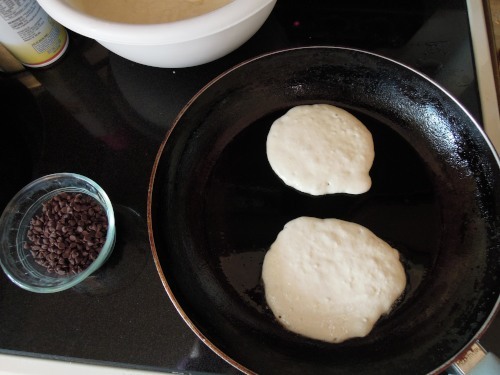 My kids love nothing more than breakfast for supper or breakfast for lunch or breakfast for breakfast or breakfast for their birthday… You get the idea. They love all of it–bacon, eggs, waffles, crepes, and most of all, PANCAKES. My oldest daughter is ten and she knows her priorities; she can already make a breakfast spread of pancakes and scrambled eggs all by herself. 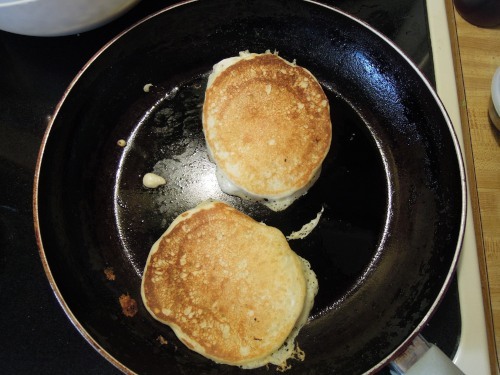 I am always “the best mommy ever” when the kids see the pancake pan heating on the stove and the tell-tale signs of pancake batter being prepared. And I am always amazed at how many they can pack away when just the night before they may have been “stuffed” after about one tablespoon of chili or something they don’t like. 🙂 Funny how that works. 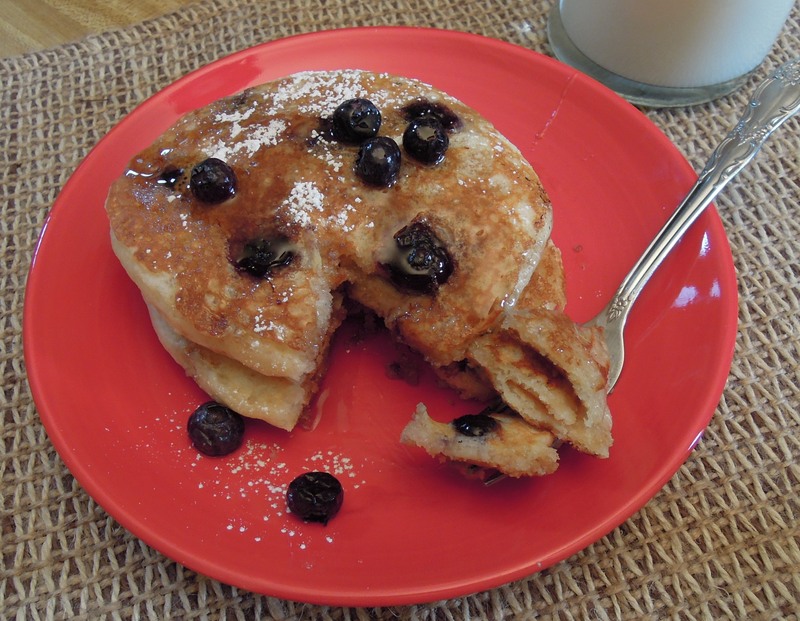 You can leave these pancakes plain or add-in some other ingredients while they are cooking. 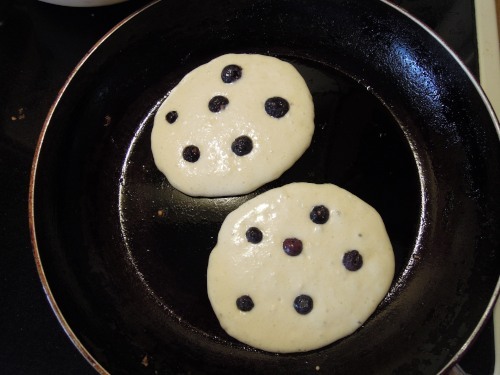 My kids love chocolate chips in theirs while I love blueberries in mine. Everyone can have his or her favorite! Yield: I got about twenty 5-6 inch pancakes. The recipe can easily be halved or increased as needed. 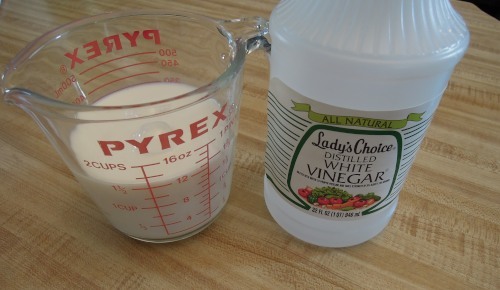 If you are using milk and vinegar instead of fresh or powdered buttermilk, add the vinegar to the milk and set aside–this will sour the milk and become a buttermilk substitute. (Tip: I measure the milk or milk and vinegar into a 2-cup glass measuring cup instead of dirtying a separate bowl for this step.) 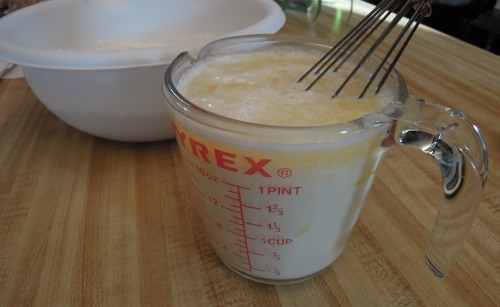 If you are using buttermilk, measure it into a 2-cup glass measuring cup or bowl and set aside. 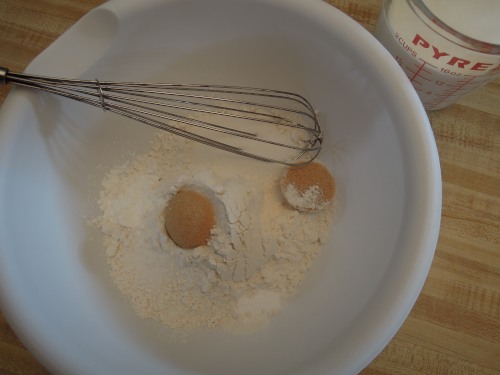 Whisk together flour, sugars, baking powder, baking soda, and salt in a large mixing bowl. Set aside. 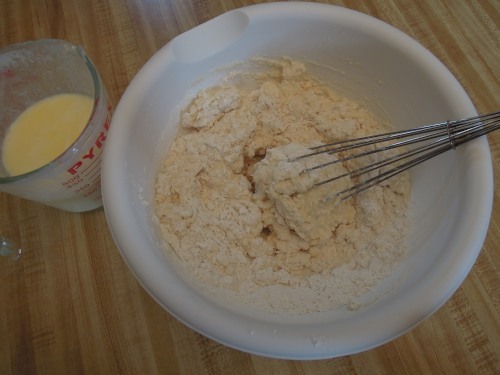 In two additions, add the milk and egg mixture to the flour mixture, whisking until the big lumps are gone and it is smooth-ish. 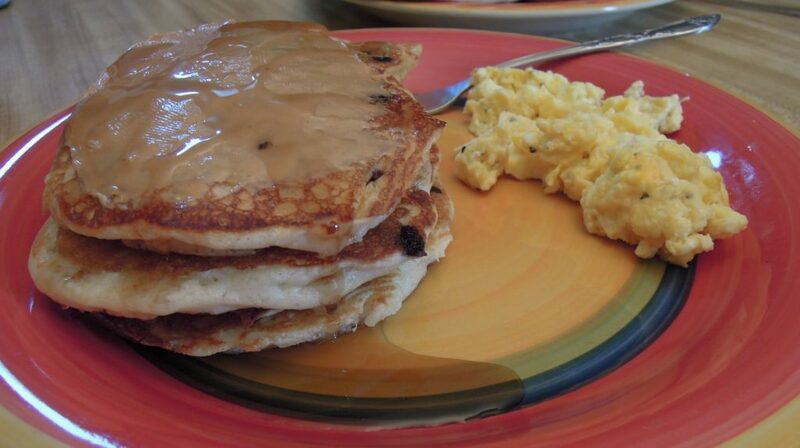 The batter may be thicker than you are used to, but the pancakes will puff up and be nice and fluffy. 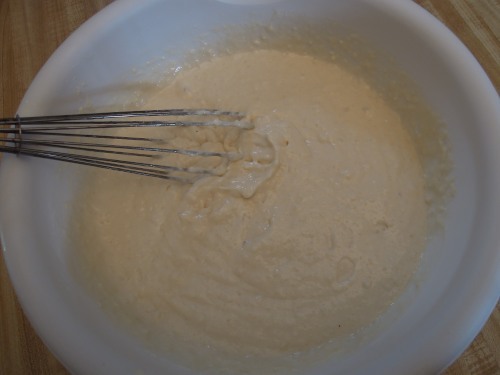 If the batter seems super thick, however, you may have to add a little more milk to thin it. First addition of wet ingredients. 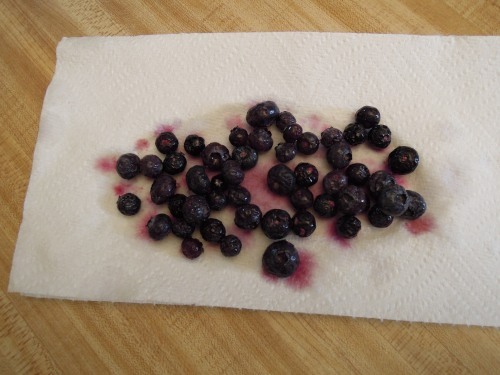 I rinsed and dried some frozen blueberries I had. Pancakes are best served hot and fresh. 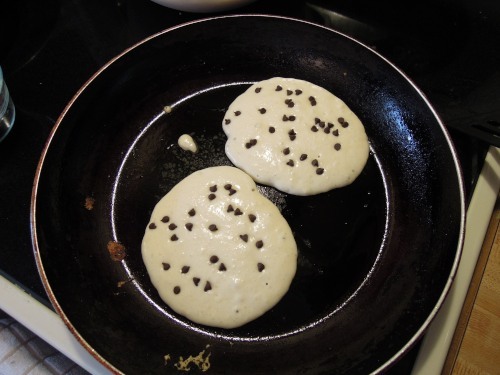 My kids love the pancakes that have had chocolate chips added. 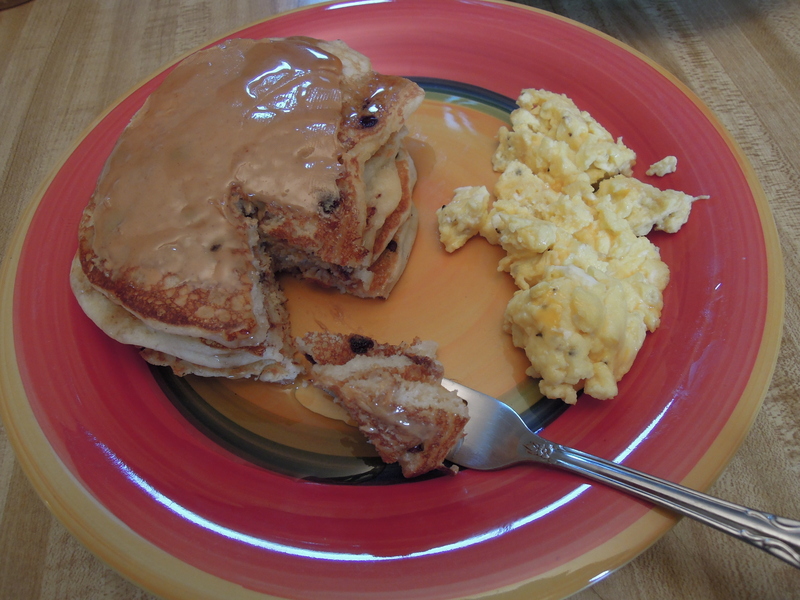 Instead of butter, they put a little creamy peanut butter on them and top with syrup. 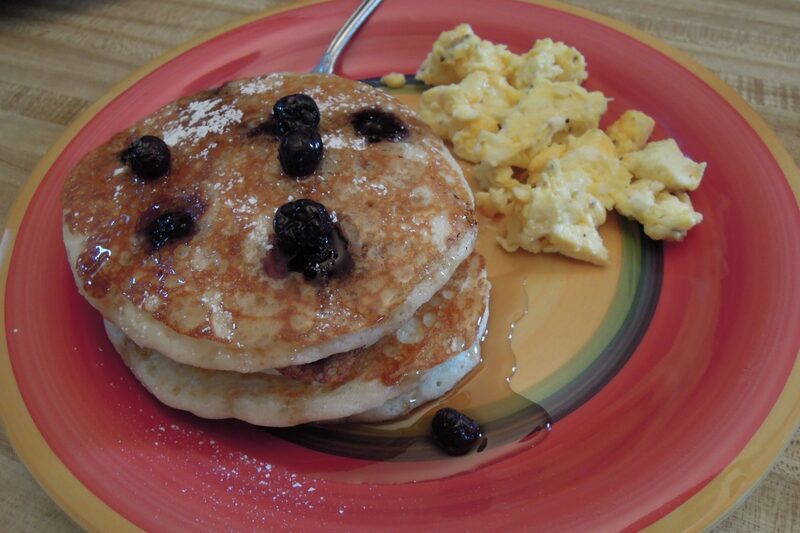 My favorite is blueberry with syrup and maybe a sprinkle of powdered sugar.